The DW 5000 Series Sidekick Pedal is an upward striking pedal, designed to play the bottom head of your floor tom. The Sidekick Pedal is perfect for cocktail kit set-ups, or for adding a new kick sound to any drum kit. It is firmly supported by an included 1/2"-thick leg, compatible with any DW TB12 floor tom bracket, and also includes a 10.5mm leg for PDP floor tom brackets. 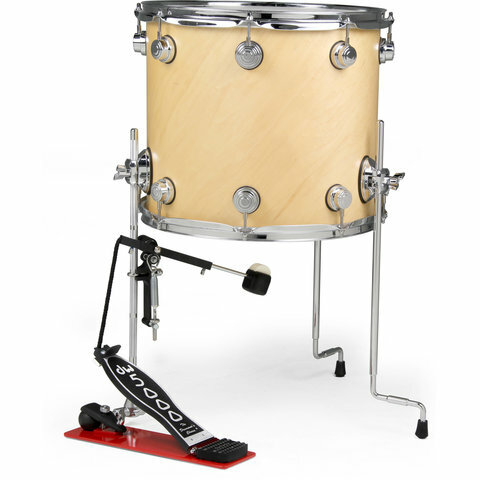 Its unique Rope Drive System feels smooth and natural to play, while the Ball Joint Leg Attachment allows nearly limitless possibilities for the pedal placement and beater angle. Finally, the Sidekick boasts standard 5000 Series features, such as DW's patented Delta Ball-Bearing Hinge, Slotted Stroke Adjustment and Two-Way Beater. Just attach the Sidekick Pedal to any floor tom to add an alternate, wide-open tone to the sound of your drum kit.